Record your own time efforts with the integrated stop watch to-the-minute. Afterwards, you can post the working time directly to the respective project. You find the stop watch on the InLoox PM Ribbon on the InLoox PM tab in the Extras group. For more information on this topic, please see Record personal time efforts with the stop watch. 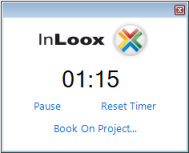 New time tracking features in InLoox PM 7 • Copyright 1999-2019 © InLoox, Inc. All rights reserved.